Aiden considers his next move. 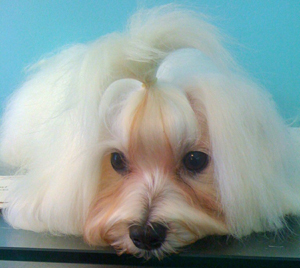 Aiden Sinanian is an AKC registered Maltese. He is a Certified Therapy Dog working with Happy Tails Pet Therapy visiting children, adults, and seniors at three different facilities each month. He also participates in special visits when he has time. You might see Aiden marching in a one of the parades downtown with the Happy Tails contingent. Aiden is also titled in Rally Obedience. He teams with Arlene to navigate a course of up to 20 stations requiring various skills. Not many Maltese participate in agility competition, but Aiden does. He loves running the course at full speed, dashing through the tunnels, and bounding over the hurdles. I have been told by many it is a joy to behold his enthusiasm for the sport. Happy, curious, and always ready for a good time, Aiden welcomes one and all to Pupcakes.